Laser technology has been the key to a number of advances in dentistry. While most of those have been in the areas of restorative care and periodontal therapy, cosmetic dentistry has also been positively impacted. 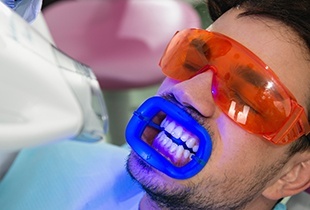 Specifically, you can now have your teeth whitened with laser bleaching in Arcadia. The process may require a couple of treatments, but the results are no less than spectacular. 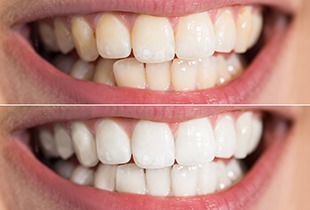 Many people opt to have their teeth whitened. A yellow or darkened smile isn’t as attractive as a white smile and it will always be a sign of aging. Research shows that people with white teeth are not only considered younger but also smarter, more outgoing, and even more financially successful than their not-so-lucky peers. There are many reasons why your smile may not be as bright as it once was. The primary reason is probably what you eat and drink every day. Think of all the richly colored foods and beverages out there: dark chocolate, blueberries, red tomato sauce, black coffee, green tea, and the list goes on and on. These all have the potential to stain your teeth. Although there are many bleaching products sold in stores for use at-home, you can only have laser teeth whitening in a dentist’s office. First, we protect your gums, lips and other soft tissue by placing cheek retractors in your mouth and a rubber dam over your gums. Then, a strong bleaching solution is applied to your teeth. The heat from our laser speeds the whitening process and also improves the effectiveness. We use a bleaching gel with a higher concentration of hydrogen peroxide in order to achieve the most dazzling results. 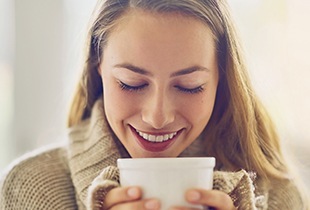 At the conclusion of your laser bleaching treatment, we’ll apply fluoride to help prevent tooth sensitivity. Each treatment takes about an hour and more than one may be required in order to reach the level of white you desire. After laser bleaching in Arcadia, Dr. Canzoneri advises his patients to avoid eating stain-causing foods for at least a few days and to use a straw when drinking colored beverages. Contact us today if you would like to schedule a consultation.